Enjoy 20% Off Coupon at checkout! 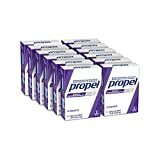 Mix up your workout with Propel Powder Packets Grape with Electrolytes, Vitamins and No Sugar. Propel Powder Packets are an easy and delicious way to hydrate your active lifestyle. Simply pour one powder packet into 16.9 ounces of water and shake. Containing Gatorade electrolytes and no sugar, Propel Fitness Water helps put back what you lose in sweat without adding back any calories. There’s more to sweat than just water, which is why Propel Water is a water with more. This is how Gatorade does water.